When I originally designed my Prius House Battery System I decided on 2 12 volt 7 amp hour gel cells as I calculated that two would be sufficient for overnight running my 12 volt Engel compressor fridge without using the Prius 12 volt battery alone or in "Ready Mode". I didn't want to run the fridge on the Prius 12 volt battery as it's capacity is not that large. I only use it to charge my phone when not in "Ready Mode". 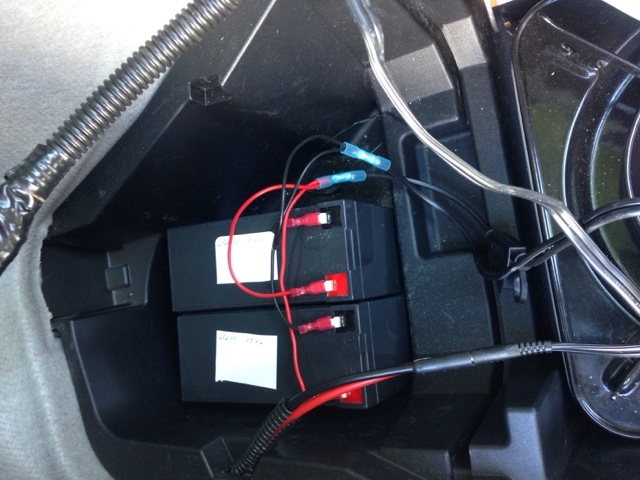 Note: In "Ready Mode" the 12 volt Prius battery is charged from the the Prius high voltage drive battery. 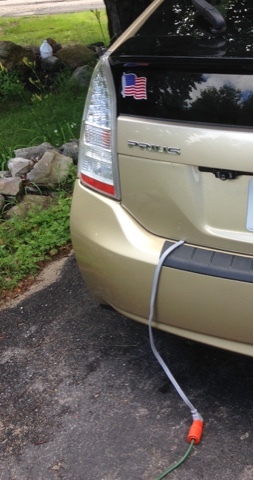 When the Prius high voltage drive battery needs charging the Prius starts automatically when in "Ready Mode". This may happen only once an hour running the compressor fridge this way. During the day when I went on long hikes (8 hours) I would run the fridge off the Prius 12 volt system, leaving the car in "Ready Mode". This allowed me to save my Prius house batteries charged for my night stay. You leave the Prius on and use a key to lock the door. You can't use the remote door opener when in "Ready Mode". The design for the house batteries worked well as the 2 house batteries lasted from 8 pm to 6 am on 80 degree days 60 degree nights and longer when colder. In April I stayed on BLM land at Lake Havasu and it was 95 during the day and 70 overnight. I ran the Prius in "Ready Mode" to power the fridge until 10 pm in order to get through the night on the house batteries. I also didn't want to stress the house batteries while I was sleeping. My goal was not to drain the house batteries below 12.0 volts. The resting voltage for the 12/7 gel cells are now 12.5 volts. These were used batteries when I started my trip but I was able to keep a resting voltage of 12.9 volts for nearly all the trip. It is time to replace them. I decided to replace the 2 12/7 gel cells with 2 12/8 gel cells that are physically the same size. When I was swapping the batteries I noticed that I had space to add a third battery to allow for better management of the house batteries. They physically fit in the rear drivers corner and allow full access to the trunk storage area and removal of trunk storage tray. This will now give me 50% more amp hours for next year. The importance of the house batteries is multi-fold. Most important is I don't have to leave the Prius in "Ready Mode" at night. It would be disruptive for my sleep and others camped nearby will not want to hear it and there are quiet hours in many campgrounds. Another important factor is that the house batteries provide for stealth sleeping in parking lots while keeping my fridge running. The compressor fridge is quiet and I have stayed in many crowded parking lots and I don't attract attention. At the top of the photo above is the multi chemistry charger that I charge my house batteries with. When shore power is available I plug into this. 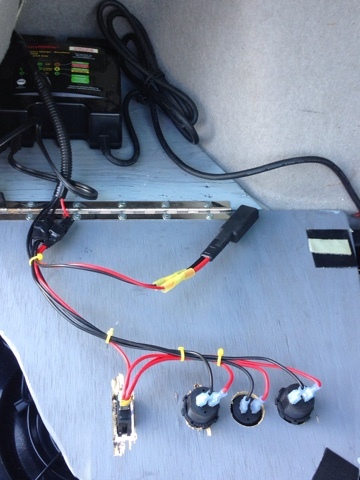 Most of the time I plug the charger into my 400 watt pure sine wave inverter that is connected to the Prius 12 volt battery that I only use in "Ready Mode". I charge mostly as I drive but may charge parking at friends and relatives. I can charge at 2, 4, or 8 amps. I mostly charge at 2 amps unless I am short on time to charge for the night. 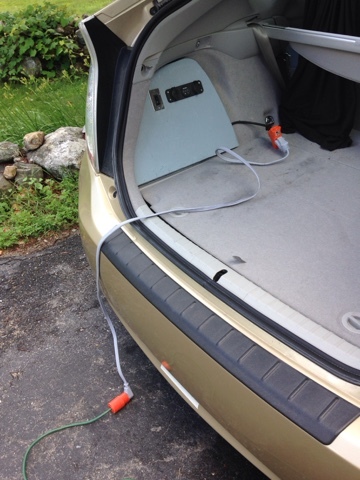 I use a heavy duty short flat cable as a shore line so not to pinch it when I close the rear hatch. This is how I charge the house batteries at home. 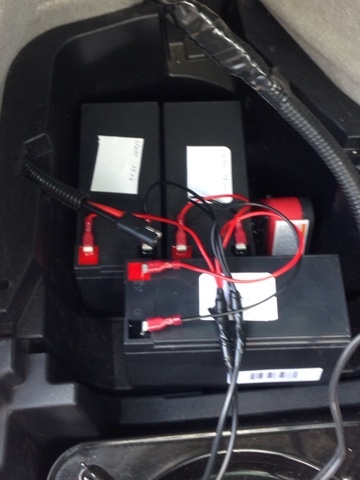 The multi-chemistry charger will charge all lead acid batteries gel cells, wet cells, and AGM. I have a connection to the Prius 12 volt battery for charging it and to desulfurization that the charger does after its charging cycle. The charger is designed to give the right voltages based on the type of lead acid battery you are using. 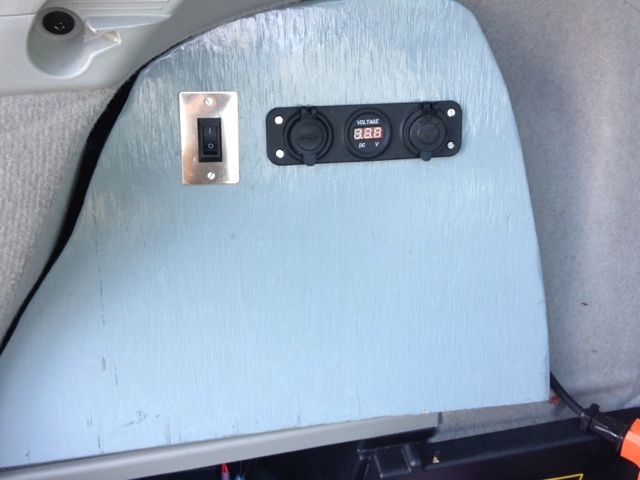 The upgraded house batteries will is one of the key upgrades to the Prius Campervan that came out of this year's travels. I am working on a redesign of the floor space behind the passenger seat under the fold-down bed platform. Can you recommend a USB based fan that fits well with the Prius? Thanks. I wanted a USB powered fan as I set up USB outlets on both my Prius and house batteries, so I just searched Amazon. You can find them in different size, color and price. They are lightweight plastic and not to be banged around much. I like mine but generally only need it for awhile before falling asleep.